We came into marriage, like a lot of young couples, with a hodge podge of home furnishings. Many things we were blessed to be able to buy new, but our bedroom, for years, has been a bit, ummm, ecclectic. For the last four years or so, I’ve been using our old changing table as a makeshift dresser. 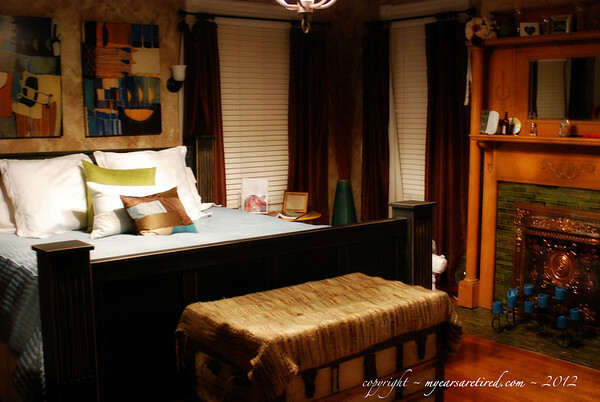 We looked on more than one occasion for new furniture that would match the bed Matt built us several years ago, but we just couldn’t justify the expense when what we had was working. Well, over the course of the Summer of Painted Furniture, God blessed us with a couple of new-to-us pieces and gave us ideas for two of the pieces we already had, and for a grand total of about $60, our bedroom furniture is finally coordinated, beautiful, and functional. Woot! And once again I’m shocked that in the thousands of photos on my hard drive, I have ZERO before pictures of our bedroom. Well, I have one. But from the angle I took it, it looks exactly like our room now. Sooo, nevermind on the befores. On to the finished product! First, the whole room. Well, sort of. From the door…. 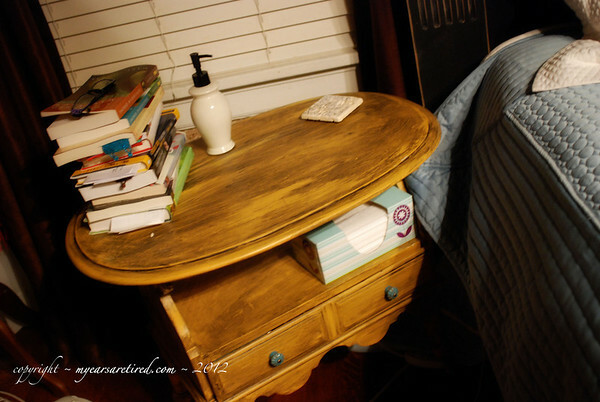 My “new” dresser and table…. The bureau was given to us by friends that were moving and didn’t want to take it with them. The table was a yard sale find. Some black paint and new hardware dressed both of them up nicely! I still need to finish accessorizing the table and buy a mirror with a frame…..all in good time. These tables were my grandmother’s. They were a light honey color before. 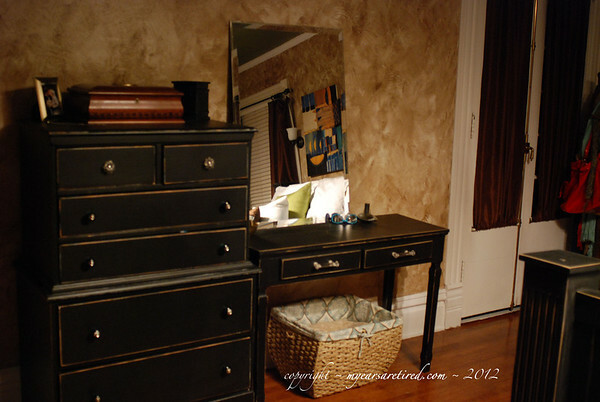 We painted them a mustard yellow color that matches the hallway leading into our room and is in the paintings above the bed, and then Matt wiped them down with a dark glaze. Fun blue drawer pulls helped tie them into the room even more. 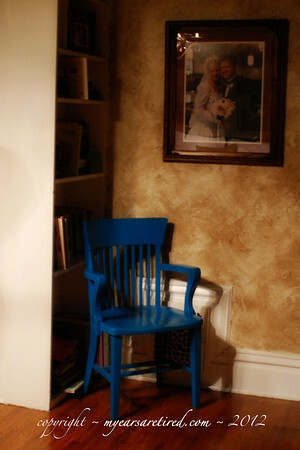 And the turquoise chair even made it into the room….just for fun! That’s our bedroom mini-makeover. Hope you have a fantastic Thursday, friends!